Take any weekday, take out the six or so hours of sleep, driving around, social visits, shopping, exercise (all three minutes), and you will quickly find that we spend most of our lives at the office. I'm very thankful that my office is a nice place to be - especially when I think how long I spend there. I do my work and my blogging from this room and it has become my little empire. Meed magazine,Q8 poster, Oil rig blueprint, travel a lot....mmm u work in the Oil sector? Yup. Q8 poster is from my 10 years there. The 'blueprint' is the equipment that we manufacture and sell (loading arms). Long time no comment... Welcome back. :) I honestly didn't do any preperation. The handful of people who have visited me know that this is how it looks... Most of the time. Paris (or near Paris) is our head office where we met to discuss how terrible Q1 was. Saudi/Qatar were both to sort out major issues including payment... We travel economy class! We go to London on holiday - my work doesn't often take me there. nice! add a plant or two and it'll be perfect! You're hitting the nerve! The Dell is the corporate standard... Nothing I can do about it - it comes from France. I'm just pleased they got me a QWERTY keyboard! I have a B&O phone from London but I haven't been able to make it work here. Do you know anyone? It's not just its beautiful design but the speaker phone on it is the BEST. Thanks. I can't live without plants. There are three little ones but they're not in the frame. At least its pleasant! I've come to the point that I hate my office! Seriously hate it! I have a dell which is fantastic and does the job! 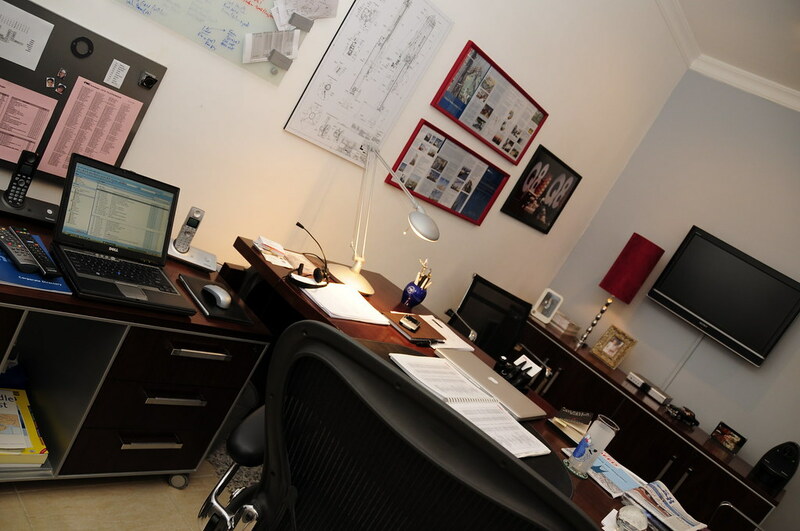 Nice office.. the only thing personal in my office is the pen holder which is an engines' cylinder head! I'm thinking about a nice office at a later point! I can't work in a cluttered place. I know friends who are the opposite.